Your garden or neighborhood could hold all the plants and herbs you need to treat everything from respiratory issues to nerve pain to colic using natural remedies that are just as good for your body as they are for the environment. 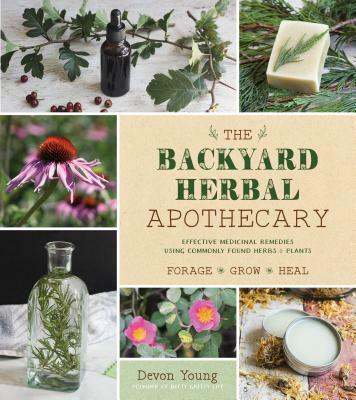 The Backyard Herbal Apothecary is packed to the brim with information on 50 different plants, recipes for 56 remedies and beautiful photography on every page. Devon Young, founder of the holistic lifestyle blog Nitty Gritty Life, is a trained herbalist and is well practiced in developing and implementing herbal remedies. As a result, each of Devon’s recipes is a natural and effective tonic for your health concerns. Use cottonwood to make a salve for achy joints, heal minor bumps and bruises with the common yard daisy, infuse some nettle to make an allergy–season combating tincture and so much more, all using safe and locally foraged plants. Poignant, captivating writing awakens the senses as you learn about the healing quality of each plant and discover how to grow and forage plants and herbs in a safe and sustainable way. Devon Young is founder of the holistic lifestyle blog Nitty Gritty Life. She has a degree in Complementary and Alternative Medicine from The American College of Healthcare Sciences and is developing her own herbalism health practice. She lives in the Willamette Valley of Oregon.